In 2016 The Winstons’ debut album came like a bolt from the blue in the Italian rock scene, and almost made a miracle in binding together two worlds often considered poles apart: indie and progressive rock; the mix of Canterbury sounds (Soft Machine in the first place) and psychedelia (The Doors and The Beatles above all) offered by this new trio turned out to be really peculiar and original. 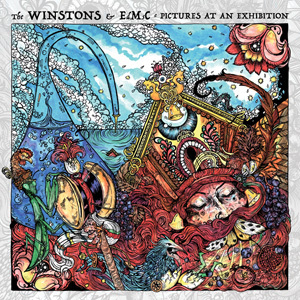 But even before their eponymous record came out, The Winstons had already played live in November 2015 their own personal reinterpretation of Modest Petrovich Mussorgsky’s “Pictures at an Exhibition”. Today, that effort is finally put on record, thus renewing the partnership between AMS Records and the trio consisting of Enrico Gabrielli (keyboards, wind instruments), Roberto Dell’Era (bass, vocals) and Lino Gitto (drums, vocals). A title like “Pictures at an Exhibition” and the ‘prog’ term immediately recall the homonymous Emerson, Lake & Palmer’s 1971 LP and, in fact, this record shares some moments with EL&P’s work. But there’s way more in this release, thanks especially to Roberto Izzo’s violin and the presence of Roberto De Gennaro (vibraphone, percussion), who collaborates with Enrico Gabrielli on the project ‘Esecutori di Metallo su Carta’ (EdSmC) and represents the contemporary and avant-garde side of this work. “Pictures …” is not only exceptional in its musical aspect, but also from the visual point of view, thanks to the wonderful front cover illustration created by Jessica Rassi at her graphic studio The Giant’s Lab. A very special release, produced in four different versions: CD papersleeve, LP gatefold in standard and limited edition, and cassette tape!